On Aug. 31, I had the privilege in our Diocese in Brooklyn and Queens of ordaining ten men to the Transitional Diaconate. This means, please God, that this coming June we will ordain these men and three others to the priesthood for service to the Diocese of Brooklyn. These young men reflect the diversity of our Diocese. They come from various ethnic backgrounds, speak the languages needed in Brooklyn and Queens and have proven themselves during their years of formation to be ready to accept this key step on the way to the priesthood. I feel particularly close to these seminarians. Many discerned their vocations when I first came to the Diocese almost 10 years ago. Each began his own vocational journey by coming to retreats, discernment groups or as students at Cathedral Preparatory Seminary. Most continued their period of formation at the Cathedral Seminary House of Formation and now in the major seminary. In my episcopal ministry, I have tried my best to follow this sound advice. Getting to know our seminarians on their road to the priesthood will make for a good presbyterate in the future for the Diocese of Brooklyn, as well as to foster a good relationship between bishop and priest. 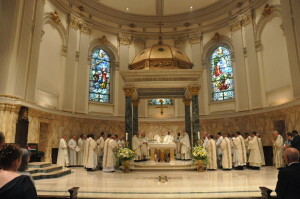 The directory for Bishops maintains that they must be both father, brother and friend to the priests of his diocese. It is not always easy to maintain these multiple relationships, which sometimes seem to contradict one another. The nature of the episcopacy and the priesthood call upon us to act in a paternal and, yet, fraternal way with one another. Some of those ordained last weekend were with me in Rio de Janeiro and participated in World Youth Day 2013. I was so happy to be with them and was privileged to see firsthand their interaction with the young people who traveled with us from the Diocese of Brooklyn. It was important for them to influence in a positive way the youth of Brooklyn and Queens on that wonderful pilgrimage. It is never easy to know how to invite young people to consider a vocation to the priesthood or religious life. Perhaps the best way is simply to be with them, to be present and let them see up-close someone who is following a vocation. This is the most valuable witness that we can provide and our seminarians, indeed, did provide this during World Youth Day 2013. Over the years, the formation of our seminarians has changed and developed. Those who do not attend the college seminary typically have to also complete two-years of pre-theology. 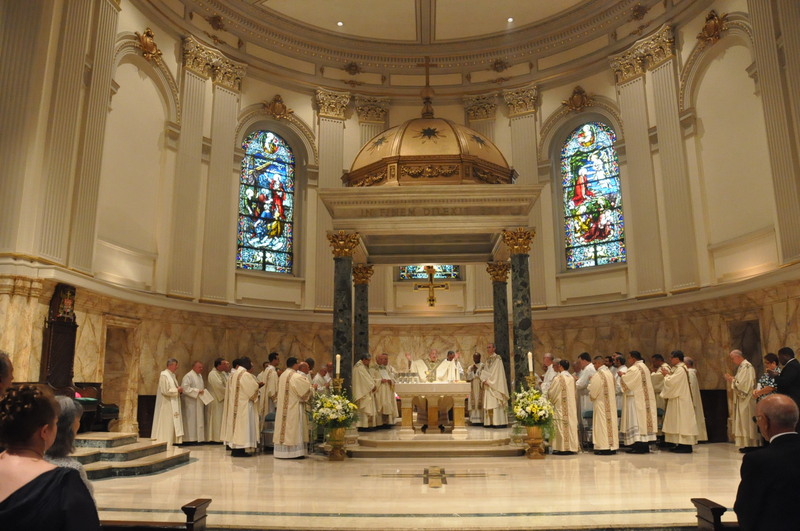 The new amalgamated seminary system for the Archdiocese of New York, Diocese of Rockville Centre and Diocese of Brooklyn, I believe, is bearing fruit. Both the Cathedral Residence of the Immaculate Conception Seminary in Douglaston and St. Joseph Seminary in Dunwoodie have proven to be an asset which brings greater group solidarity and enthusiasm for the formation and education processes. This group has been privileged to experience both Douglaston and Dunwoodie, as well as Huntington. Our new formation system is developing a deeper fraternity among the future priests in each of the metropolitan area. Our inter-diocesan future relationships will be much stronger and more productive in the years to come. On another note, we are looking at our high school seminary, the Cathedral Preparatory Seminary, in a new way during this coming year under the leadership of Father Joseph Fonti. Father Fonti will serve as the Rector and President. I am confident he is well situated for this important ministry in the life of the Church because of his many years as a parish priest, pastor and spiritual director of the college seminary. Father Fonti will be assisted by Mr. Richie Diaz who will serve as the principal with specific responsibilities for the academic life at the Prep. In this new model, Father Fonti is charged with looking to revamp our program to meet current needs and assist these young men in the discernment process. I am convinced that even high school students can discern a vocation and make decisions to follow a priestly vocation. If some do not immediately go on to our college seminary they may do so in other circumstances. For those who do not continue to pursue a priestly vocation, we can be sure that they received a fine Catholic education and will be lay leaders in our Church who support the ministry of the clergy. We will make every effort possible to assist them in this process of discernment. I take this opportunity to congratulate our new transitional deacons – Jeremy Canna, Vincenzo Cardilicchia, Jason Espinal, Felix Herrera, Evans Julce, Gregory McIlhenney, Peter Penton, Robert Pierre-Louis, Anthony Rosado and Carlos Velasquez – and the two studying at the Orchard Lake Seminary in Michigan who were ordained earlier this summer – Marcin Chilczuk and Cezar Jastrzebski – and Juan Luxama who will be ordained a deacon in Rome this October. Please pray for our fine seminarians during their final year of seminary studies. Hopefully, in June we will ordain these 13 men to the priesthood, the largest class in ten years. It is my deep hope that the Lord will continue to bless our efforts of putting out into the deep waters of our society today and fishing for those called to the priesthood and religious life here in Brooklyn and Queens.